It's the future! In addition to creating Visual Reality content, we can now also "traditionally" film people in virtual reality environments. What?? Virtual reality contains many innovative game and narrative experiences. The current problem is that not everyone owns a VR headset. They're still at a high price point and not everyone is into it (until they try it!). The best way to demonstrate a VR experience to someone without access to VR, is to traditionally film a person in VR. Below I will tell you how we (myself + Outpost VFX) accomplished it. Why??? Filming a composite of a person in a VR experience allows everyone else to witness the experience from a "normal" viewpoint. Put it this way, if you only watch someone's point of view in VR, it's like watching footage from a go-pro haphazardly falling out of the sky, the player's point of view spins every direction on a static screen, which is disorienting and chaotic. If you're watching someone in VR in reality they just look like a crazy person spinning around the room making erratic movements. Compositing the person into the environment is the best way to get a sense of what is going on, since from their POV the environment is static and we now can observe it in a normal way with them. How?? By mounting a virtual tracker (or an extra VR controller) onto your camera (any camera) it's possible to film someone while simultaneously showing the VR environment they're inside. This is called "mixed reality." As a technophobe with an aversion to words like "virtual reality, mixed reality, sautéed reality, and upside-down and backwards reality" I have to say that the process (from a DP stand-point) is simple and a ton of fun. I couldn't help but get giddily excited once I was operating a camera seeing and filming things that didn't exist in reality. Once your virtual camera tracker and real camera are aligned, a feed goes to the computer, composites the subject (usually in front of a green screen), and sends the composited image back to your viewfinder allowing for the entire VR environment to be filmed. Here are some examples of the evolution of the process. Recently we worked with a game called RacketNX to show their game live at some VR conventions. In the future I am curious how this tool can be used in narrative environments or even as a pre-vis tool. Hopefully this is just the beginning. Green screens, blue screens, and chromakeys are used in many types of productions. They are most often used for background replacements on films, music videos, news casts, and comedy skits. The effect can be small, like adding depth down a hallway in an already extravagant set or can be used for a larger effect to later place a character in a completely different environment. The main goal when lighting any green screen is to light it even and simply. Use soft sources. This will help spread the light more evenly across the screen. Since the direction of the light should be invisible the screen can be lit from above, below, the sides, or where-ever is appropriate depending on the size of the green screen and the space it is in. It can help to make your lighting symmetrical. Place lights equidistant from the screen and spaced out evenly between each other to keep the exposure even. It is easier to place a few lights accurately than to keep adding excess lights that will risk unwanted shadows and more unevenness. Check that your exposure is even. It is often said that lighting the green screen one F-stop above or below the camera's set exposure is best, but for the work I have been doing this has depended on the circumstances. For one show in particular, I underexpose the green screen a little because there is a reflective issue with a set piece that looks better if the screen is not as bright. Know your background. If shooting a green screen for a narrative or short film, know what is going to be composited onto the green screen before shooting. In order to seamlessly blend a subject into a green screen environment, it is crucial to have the lighting environments match. For exteriors, always consider the sun direction & intensity, color of the surrounding objects that creating bounce, and objects that move and may interact with the lighting on your subject. For interiors consider the quality and direction of any practicals or light sources in the background, as well as color temperature. For a news show with a green screen background, standard flat studio lighting works well and these considerations do not apply since the newscaster is supposed to look like they are in a studio the background environment does not effect how they look. The most important factor is that if it is supposed to look like they are sitting in front of a window overlooking a city then it is good to have an appropriate backlight. Watch for reflections. Make sure your actors are a safe distance away from the green screen and they are not reflecting any green light bouncing from the screen behind them. When shooting objects with reflectivity or glass, especially when using a green screen for car scenes, be careful not to have any reflections interfering with your actors. Framing: Be careful of the edges of the subject when shooting a subject that will later be isolated. A subject can be moved around in post once isolated from a green screen if necessary, but if the subject is accidentally cropped that could be an issue. When isolating a subject make sure the green screen covers their entire perimeter that is being used. Focus: Sometimes people can have problems in post if your subject goes out of focus into the green screen. Especially if a sharp image is being keyed into the green screen, you don't want a weird focus issue or a blurry edge. Keep your aperture small. When shooting a background plate and a subject separately keep in mind your iris and focus settings to help keep them consistent so the elements can blend more naturally later on. Movement: Don't move the camera unless you are going to place tracking points on the screen and also have a matching plate to move with it in the background. The set had already been lit with moonlight (blue) lighting and one of our actors was wearing jeans that had some blue pigment in them. This made it hard to separate the actors from the foreground. Ultimately it would have been better to use a green screen regardless of the foliage so that the actors could be keyed properly or once locked into the blue screen, the scene in particular should have been shot with tungsten light and corrected later so as not to add blue to the actors. On some projects with limited time or means for color correction, the best option is to bake a look directly into your camera. A basic REC709 curve can give you a "normal" looking image that is passable, but once in a while it is nice to a have a look tailored to your tastes or to match the look of another camera you are shooting with. There are many great mathematically accurate ways of doing this (which I will not discuss now, but basically involve measuring the RGB values in decimal points and plotting them onto a graph), but I will describe a simple, non-mathematical way of creating a look to use in-camera. Download the most recent version of DaVinci Resolve here. The non-studio version is free. Make sure you are using the codec settings you will be using for your shoot. Do not add any 709 curves, LUTS, matrix settings, or looks of any type. The 'raw' image should look grey and flat. Make sure your exposure setting, f-stop range of the environment, color temperature, and ISO are all similarly set to how you intend to shoot when using your LUT. Including a grey card and skin tone is helpful. Load the .cube file onto an SD card. Put in your cameras correct file structure on the SD card so it can recognize the card. For the FS7 the card file structure is below. Insert the card into your camera and open the .cube file. by going to the File menu then "Monitor 3D Lut" and select "Load SD Card." Save as User 1, 2, 3, or 4 and make sure to select that User LUT and turn on the LUT in your viewfinder and recording settings to view or bake it in. Ba-da-bing, ba-da-boom! You got a LUT. Filming underwater requires a lot of preparation. A great resource in Los Angeles is Hydroflex. It is an excellent place to rent an underwater housing, the owner is very nice, and the staff is incredibly helpful to answer any questions specific to your project. Testing all of your equipment with your camera operator and scuba operator is essential. How will you communicate with your scuba operator underwater? Hydroflex has underwater speakers you can use to direct your operator how to adjust frame, when to roll, etc. Where is the best place to shoot your underwater scene? Water quality is an important factor. Shooting in a controlled environment like a pool or a tank means the water will be relatively clear and it will be easy to plug in lights and black out parts of the pool with Visqueen if you need the pool to feel like a deep abyss. Shooting on location in an ocean, pond, or lake is challenging because you must first determine how murky the water will be. If the water is extremely dirty you will not see much of anything and be limited to mainly close-ups. This could be a cool effect, but it's important to be prepared for it. How long will your crew be in the water? If anyone will be in the pool for an extended period of time it is a good idea to have them wear wetsuits to regulate their body temperature. This applies even in a warm environment with warm water (particularly warm still water) because warm water conducts heat away from the body and can cause hypothermia. How do you plan to monitor from above what your scuba operator is doing down below? Remember to get an underwater BNC cable. Make sure everything is water safe! Especially camera cables running into and out of the water. How do the actors need to behave underwater? If there are any scenes requiring an actor to stay underwater without floating back up right away it may be a good idea to have weights in the pool that they can grab onto to prevent themselves from immediately floating back up to the top. Using a DSLR inside of a "camera bag" that is "designed" for underwater shooting. Trust me, it's not. These bags fog up and make it impossible to control your settings or focus with the lens. If you are lucky after a lot of frustration, you at least can put the camera under the water and roll on things, but it is very stressful and not a good way to shoot anything accurately. On this shoot we decided to keep things low budget and have a small crew. We had a scuba certified operator, a monitor, a Nauticam housing, and lit mainly from outside of the pool. LIGHTING: First and foremost, always use GFCI's on everything. Nothing is worth risking anyone's life when dealing with electricity near water. Every light (even and especially if it is outside of the water) needs to have a GFCI on it incase the light accidentally gets knocked into the pool (here is a great link to more about GFCI's). Underwater lighting is available from Hydroflex, but it may not always be essential for every shoot. A common way to shoot is using HMI's outside of the water to create a punchy backlight and maybe a light inside of the pool for fill. The next consideration is how much bounce will you get from the walls of the pool? Comparing a pool with white walls to black walls is a world of a difference. If you have not lit underwater before, it is a good idea to do an experiment in your bathtub with how light acts on objects in water. If you line the bathtub with a black garbage bag it will entirely change the contrast and look of the object in the water. Obviously the effect of this will be heightened in a small space like a bathtub, but it can help give a sense for what is happening on a larger scale in a larger pool with larger lights. Additionally if you want to create caustic networks reflecting on the outside environment you can also test which surfaces make this reflection more pronounced. In a shallower pool a darker surface will reflect the water networks better and a white one will wash them out. CAMERA: Rent or borrow the appropriate camera housing. For some housings it is important to know which lenses you will be using in advance since you will need to rent a specific lens attachment for the housing to match your lens. Most underwater housings are more compatible with wider lenses. Have the camera as set and ready to go before putting it in the water. Once it is in the water it is time consuming to change media and perform tasks that are usually fast outside of the water because the housing needs to be depressurized and readjusted. Caution: Look out for bubbles your scuba operator may create while framing shots underwater. If they get into your shot it will ruin the cinematic illusion of your film and/or be a pain to remove in post. Shooting underwater is a really fun way to see things from a new perspective. If you are shooting something only partially below the surface of the water consider simply using a fish tank or a pole camera. Pole cameras can be used to stick your camera underwater without having to go in yourself. They can be used for nature documentaries to avoid getting eaten by a shark or simply attached to a Go-Pro to get some cool perspectives. Even less invasive, if you are shooting near the surface of water, or in waves also consider using a splash bag, however it will not give you much control over the cameras focus or settings. There are many ways to create beautiful images underwater and your imagination is the only limitation. Stay safe! Celebrity interviews are a great way to get up close and personal with some of your lifelong idols, but can also be daunting if you screw it up (I will never forget the time the director I idolized for my entire childhood walked into the room and instantly started telling me my lights were all backwards). I mainly have shot celebrity interviews for awards shows, promotional material, behind the scenes, and documentaries. For an award show or promotional material the top priority should always be to make the interviewee look their best. For behind the scenes, there is usually not enough time for proper lighting and it's mostly just exciting to get an interview at all. For documentaries it can be nice to discuss a consistent "look" across all of your interviews with the director so the entire project has a feel of cohesiveness and a set mood based on the subject matter. In this article I am going to discuss shooting individual interviews with celebrities for promotional material and having to light for a series of different celebrities in one set-up. When shooting a single interview of a specific person it helps to think about how to light them in advance. Quickly taking a look at a recent picture of the celebrity and even previously conducted interviews is a helpful way to see what lighting works and doesn't work for them. Some celebrities, particularly those who are aging, balding, etc. need special care when it comes to lighting. The biggest things to watch out for are celebrities with deep set eyes (don't want to put the key light so high that they have dark circles instead of eyeballs), celebrities with wrinkles (best to keep the lighting more frontal), and celebrities without hair (be careful with the backlight! No one likes a head that looks like the sun is emitting from it!). Some celebrities even have a particular side of their face they would prefer to put towards the camera, which might be something to ask about in advance if there is the opportunity. For all celebrities, it is often best to put their needs over your cinematic intentions. LIGHTING: When lighting a series of interviews where celebrities will be sitting in the same lighting, it is best to err on the side of caution and light it in a way that will be most flattering for everyone. The best general approach is to use the softest lighting possible on the actors. I usually use a Kino through light grid diffusion as the key light. This usually wraps around 3/4 of their face. I usually place the light close to directly where their eye-line is off screen and up a few feet, this way they are looking into the light and catching the eye-light instead of looking away from the light into the darkness. For example, if the interviewer is interviewing from the right side of the camera the key light will also be on that side. If there are any light sources in the room I try to put them in the background on the same side as the key light to help the key light feel motivated. A soft, high backlight also adds a nice glow to the actors hair. If someone bald sits in the frame it is good to have a double net on standby to knock out the backlight or simply turn it off if that is the best option. CAMERA: I usually place the camera sightly above the interviewees eye line. Especially many women prefer not to be filmed from below as the angle is not very flattering. Having the interviewer sit (or stand) as close to the lens as possible helps so their eye line is as accessible as possible to the audience without having them look into the lens (unless this is desired). Shooting interviews is a fun simple job that can help you hone in your beauty-lighting skills, while also getting the chance to meet some cool people and learn new things from your interviewees. Below are a few lighting setups from various interviews. This is an interview setup we did one year for a series of celebrities where we inevitably had daylight spilling into the rom at varying times and amounts as the sun moved through the sky. In order to go with the flow I set up two Kinos and spread a long roll of diffusion across two stands spanning the length of both Kinos. This created a super-soft natural look that was only augmented nicely at times when the sun was entering the room and hitting the floor. This is a setup we did one year for a series of celebrities. The Kino for a backlight was soft and flattering and another Kino vertically near the eye line of the celebrities gave a nice exposure on their faces. Yesterday I had a shoot for a promo for web series in the process of raising funds through Kickstarter. We shot a 6 page episode in a half day in a hotel room. 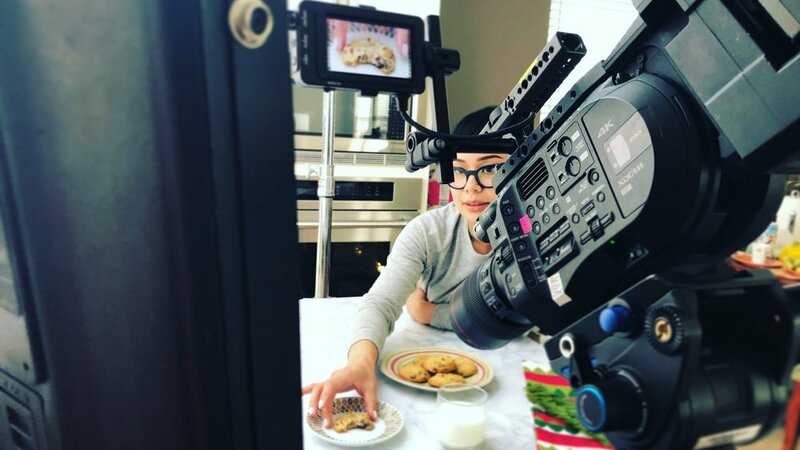 Having to be discreet, we showed up with a four person crew, my Sony FS7, Kino Gaffer's Kit, household bulbs, some Milano cookies and successfully shot a hilarious episode while leaving a small footprint. LIGHTING: Practicals, practicals, practicals! With a small space, low budget, limited time, and numerous in-scene lighting queues I knew the best way to approach lighting the room was using practicals. I brought along an extra standing lamp and a bunch of 71w and 100w Type A lightbulbs to switch out in the fixtures already in the hotel room. Usually lighting in hotel rooms use the new halogen or compact fluorescent light bulbs. If we had used these the light would have a green color-shift. Sometimes this can be corrected in post or balanced to with the camera, but I think it's always best to play it safe and switch out the bulbs to something I know will not have problems on the actors skin tones. When the actors turn off the practicals I created a soft moonlight fill underneath so the actors could turn the lights on and off as needed. For the moonlight, I bounced a Kino with daylight bulbs into the ceiling. It looked a little too blue, so I added a 1/4 CTS. This worked well as the moonlight look when all of the lights were out. Challenge: The comforters on the bed were white and had reflective satin stripes. This made it difficult to keep the actors faces exposed properly while trying to mute down the brightness of the bed so the moonlight did not look overpowering. Solution: I moved the light around the so that the source was coming from further away and less near the comforter, but it did not completely solve the issue. Next time I would ask if production could bring dark-toned (or if it needs to be white, then an eggshell or off-white tone) comforters to switch out with the ones provided by the hotel. As a DP, you could also bring a bunch of flags and stands to try to flag it down, but in a tight space and no extra crew this could eat up your time between set-ups and even start to become dangerous. FRAMING: Shooting in a small place can be limiting, but can also provide the ability to frame shots in layers. In order to make the hotel room look more dynamic (and because this scene relies on tension between two actors) I was able to include many foreground elements in my shots. Creating layers helped build the illusion of depth in a small space and also worked out really well in some comedic situations where we can see one actor sleeping, while the other is a force in the background. For shots looking down on the actors, we brought a decently high step-stool which was crucial to getting the high angle shots without stepping on the actors or the bed. MONITORING: Since this was a low budget shoot, a great way to let the directors see the framing without having to climb up on furniture was to connect the camera to the hotel TV with an HDMI. This was super helpful, but also can be distracting if left on in view of the actors while they were performing. Because there was no budget for large grip equipment and because it was motivated by the script, we shot this episode handheld. This was great because it freed up space in the small room. For many shots I also held the camera loosely onto a tripod, which helped me have more control over the focus as I did not have to hold the camera with one hand while focusing with the other. Frame grabs of a single shot with foreground elements and a lighting change. The goal of this shoot was to create a blood element that was not able to be done in principal photography and also not able to be animated in post. To do this, we had to recreate the original shot and then add the blood element to be isolated from our shot and composited back onto the original footage. Using some basic techniques we recreated the blood element as if it was in the original footage. LIGHTING: In order to make the blood element work we needed to recreate the lighting conditions the astronaut was originally filmed in. We printed the original shot onto a large piece of paper so that we would have the astronaut reflected in the pool of blood. This was the most important element to making the blood feel as if it was part of the original scene. We printed a large poster of the image (a matte version would be best to avoid unnatural reflections), cut out the bottom of the frame, and inserted our blood element into it on a piece of cement we bought from Home Depot. It was also helpful to have a ground surface similar to the original so the edges of the blood did not look different or reflect a different toned surface. 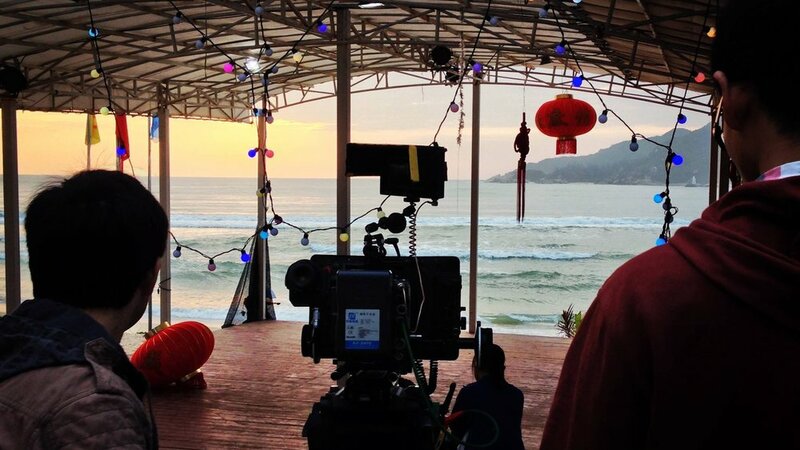 The second most important lighting factor was the sun's position during principal photography. As we could see in the astronaut's helmet the sun was very frontal. Lastly, the location of the astronaut was important as he was in a large parking lot with vast open sky in front of him. In order to replicate the direction and space of the environment we filmed the blood element in an environment that faced an open sky. Once we had these conditions set up we dropped the blood onto the concrete and filmed it in 4K. CAMERA: Make sure to replicate the same angle, height, and lens as close to the original shot as possible. The most essential component to having a shot like this come out successful is to have the VFX person on set to making sure everything is executed properly and that the look of the element is what the director was aiming for. All in all, once composited back into the original footage, the blood element came out looking pretty believable. Shooting cooking shows are a lot of fun and an opportunity for me to combine two of my favorite passions, cinematography and eating! This show was an internet promo for food pairings with Stella Artois. Because we ran the segment a few times I got to eat some amazing bocadillos pequenos! LIGHTING: Making the show hosts and their food look appealing are equally important. This show was meant to look bright and cheery so we kept the lighting soft and natural. We used two HMI's into a bounce and one just into a wall then filtered the bounce through diffusion to light the the interior. It was great to have all of this light to fill the room indoors so that we did not lose any exposure as the sun started to set outside. Outside we put some daylight Kino's coming through the windows to emulate the daylight coming from outside and also to overpower some of the green spill we were getting on the white interior walls from the greenery outside. In order to make the food look appetizing it was important that the color was saturated, the food was exposed properly, and the depth of field was appropriate. There is a lot of advice out there on how to light food properly. Some people will suggest creating a jungle of lights so everything is just perfect, some say a single source and a bounce is the best approach. I think for a cooking show, there is often not a lot of time to treat the close-ups as if it is table-top photography and a nice, simple overall lighting approach is best. Every situation is different and the most important factors to consider are brightness and contrast (does the food look inviting? ), saturation (does the food look fresh and vibrant?) and presentation (hopefully there is a food stylist on set, but if not make sure to arrange the food and if adding specks of water or reflection can help when photographing vegetables). 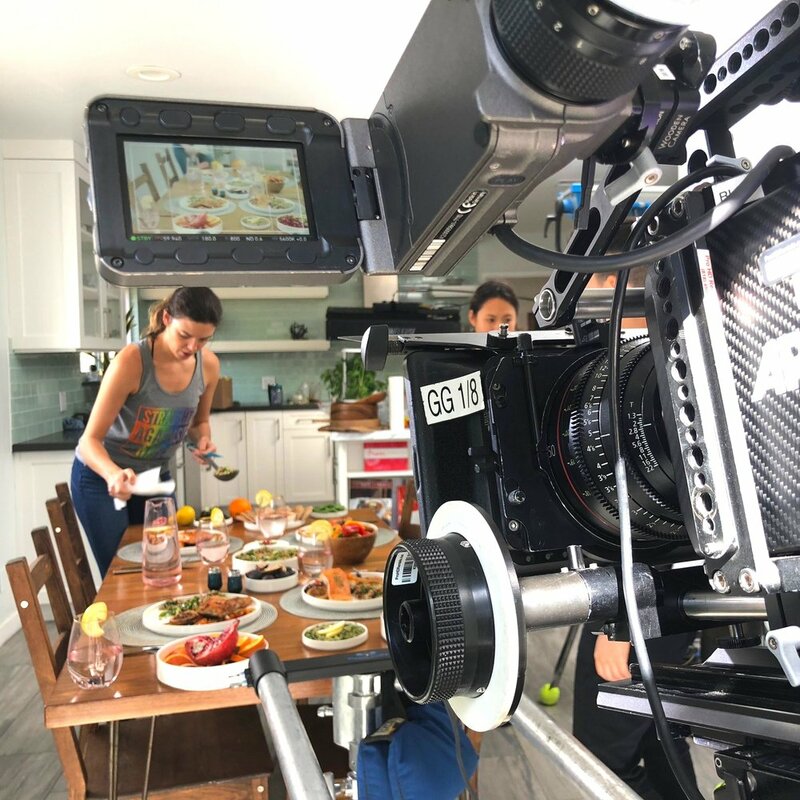 On this shoot the only adjustment we made between the hosts coverage and the food coverage was moving the HMI in the back and aiming it to hit the ceiling above the food to fill it in. As far as depth of field goes, a mentor of mine once said to make sure to keep all of the food entirely in focus because no one wants to eat blurry food. After shooting a few cooking shows I have realized occasionally throwing the backgrounds out of focus can help the food look even nicer, especially when it comes to getting close-ups of baked goods. CAMERA: This was a two camera shoot. I have done other food shows where we have three cameras, which provided coverage of the food while also getting a wide and a close-up of the host. This made it more possible to do the entire show in one take. With the two camera set up we did the first pass framing for the wide shot and the host and the second pass with both cameras getting inserts of the food, often talking the host through the shots and repositioning as we went. 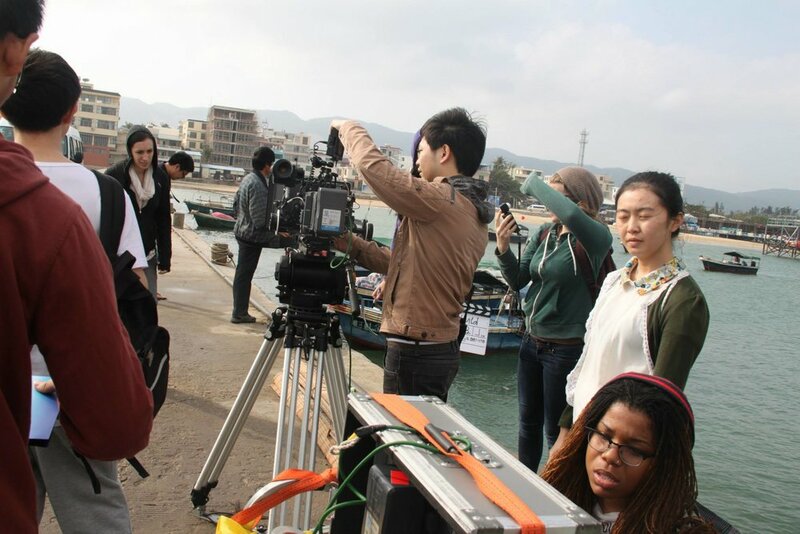 On this shoot we used two Canon C500's. This shoot was great! I ate a lot of good food (even got to steal some Stella afterwards) and worked with a lot of cool people. We filmed a series of three episodes that received half a million views on Facebook.